After promoting Japanese food products in India for over three years through gourmet stores, Maidoindia has now launched an exclusive stand-alone-store for its fresh food division, Sushi and More. The store is spread over 200 sq ft area and offers only take-away and home delivery options (in a particular area). The Sushi and More has been designed by its own design division – White Spark Designs which has used Japanese principles of design like space, hand craftsmanship, traditional innovation and more to design the store. The store is small but includes a lot of elements. The store is divided into three sections - a hot section, a Sushi section and a retail section. Usually Japanese products are position as expensive in the market. The company would like to change that mindset by serving affordable Japanese food which is authentic and fresh made. “In three years, we have seen a tremendous increase in Japanese food product demand, however the most common feedback we’ve received is that it is very ‘expensive’ to have it on a regular basis. This prompted us to develop and price our product range between Rs 120 to Rs 400, something that’s never been done before”, shares Jodhani. The Sushi and More menu ranges from Miso Soup, priced at Rs 120 to Japanese lunch box available at Rs 450. The store also stocks many Vegetarian options as well. Sushi starts at Rs 230 and goes upto Rs 380 for 8 pcs. 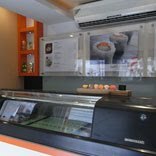 As the store name suggests, Sushi and More, the menu also serves dumplings, tempuras, teriyaki skewers, Japanese curry and the Bento box (Lunch box). Apart from the serving menu, the store also shelves packaged retail products such as Kikkoman soy sauces, miso soups, wasabi pastes etc. When asked how difficult it was to create a consumer base for a new product range, Jodhani replies, “It has been very challenging getting consumers to try out a cuisine so different from what our palettes are used to. But it has been a great journey so far and we are confident about the future with the great response we have received in the first month of our opening.” In order to crease the brand awareness about the Japanese food product and the store Sushi and More, Maidoindia is spreading messages through online marketing like E-mailers, Facebook and Twitter. The company is also trying out Outdoor advertising through hoardings, etc.